Taylor-made systems for municipal solid waste (MSW), separately collected bio-waste, with or without power plants, for composting, for incinerators. 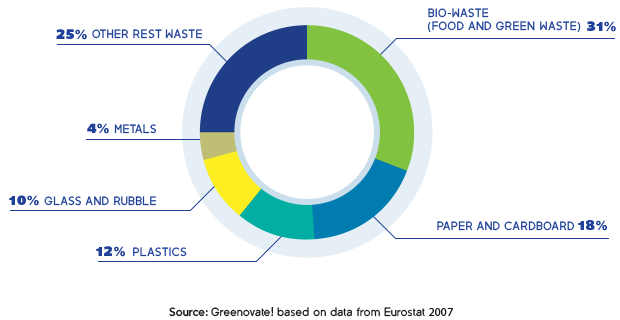 Europe’s largest waste stream is Municipal Solid Waste (MSW): the daily waste from our households. 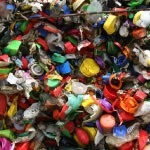 It consists of 6 main product groups: bio-waste, paper & cardboard, plastics, glass & rubble, metals and other rest waste. Rather than importing these valuable raw materials and resources from other parts of the world, it makes sense to re-use and recycle them efficiently. Bio-waste represents the biggest fraction of MSW, yet the recycling of bio-waste is still in its infancy. If treated properly, bio-waste can result in high-quality compost and biogas thus avoiding the emission of greenhouse gases and the loss of high-value material. Today, Europe loses 60% of its 3 billion tons of solid waste through landfilling and incineration each year. EU Directives such as the Waste Framework Directive (2008/98/EC) and the Landfill Directive (1999/31/EC) are slowly changing this situation towards a circular economy. Moreover, in July 2014, the European Commission has released the Communication ‘Towards a Circular Economy’ and a new Legislative Proposal for Amending the Waste Directives putting forward ambitious recycling targets for 2030. The households are asked to sort their organic waste in specific bins. While source separation is theoretically the best means to achieve clean organic waste, the reality looks different. Mentality and culture influence the participation rate and the separation efficiency, but regardless of these, experience has shown that it is hard to implement organic kerbside collection in densely populated urban areas. Due to problematic hygiene conditions and high personnel cost, manual separation of bio-waste is not an option. Mechanical separation through shredding and sieving is the most widespread method today, but its efficiency is not optimal and the high remainder of organics in the non-organic fraction and or non-organics in the organic fraction causes problems for both streams. 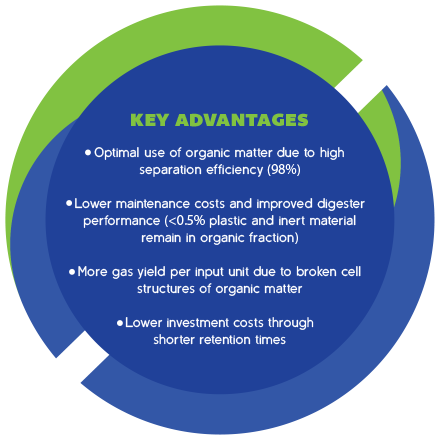 The innovative SEPARATE waste system overcomes these problems with an unprecedented separation efficiency: it removes 98-99% of total soluble organics from contaminated waste streams, leaving the organic fraction pure, and the non-organic fraction dried and clean. 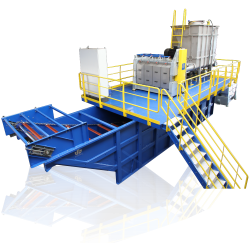 The mobile unit will carry the SEPARATE Waste System consisting of a hydraulic press (the OREX PRESS) and a cleaning system (the CYCLONE). The OREX PRESS is an innovative hydraulic press that achieves highest separation efficiency (98%). Under the high pressure, the soluble organic matter behaves like a liquid and is separated from the dry fraction. The Cyclone is used to further clean the organic fraction. In the Cyclone, the material is rotated at high speed pushing the organic material through a perforation and separating it from the material that is bigger than the perforation - typically plastic film. 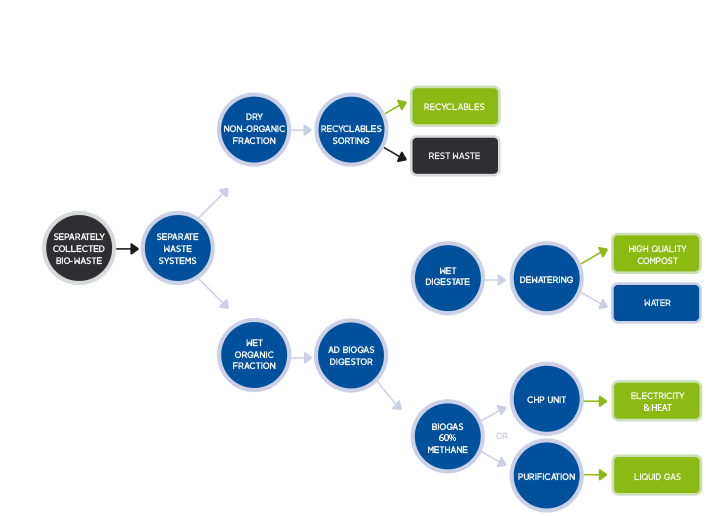 SEPARATE Waste Systems enable the efficient separation of MSW, separately collected bio-waste and mono-streams into a very clean organic fraction and a non-organic rest fraction. 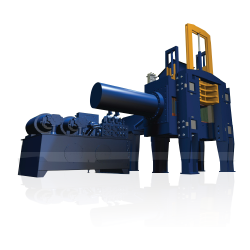 The heart of the SEPARATE waste system is an innovative hydraulic press that achieves highest separation efficiency (98%). Mixed waste is loaded into the OREX Press and under the high pressure, the soluble organic matter behaves like a liquid and is separated from the dry fraction. The organic fraction is further cleaned to limit the remaining impurities such as plastics and inert materials to less than 0.5% of the total organic matter. 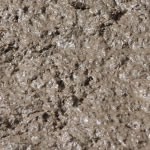 The result is a homogeneous paste that is perfectly suitable for anaerobic digestion and ensures low maintenance costs of the digesters. The cell structures of this organic material are broken up whereby a high gas yield with shorter retention times can be achieved. Short retention times are of economic importance as they reduce the investment costs for digesters. As a result of the very clean separation, a number of high-quality products can be obtained. 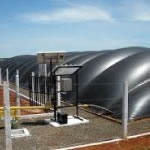 The organic fraction undergoes anaerobic digestion to produce biogas that can be transformed into electricity and heat, or can be purified to feed-into the gas grid or to be bottled as liquid gas. It can also be used as process gas in thermal power plants. After it has released most of its gas, the digestate from the anaerobic digestion is stabilised and prepared into high-quality compost according to European Compost Network standards. 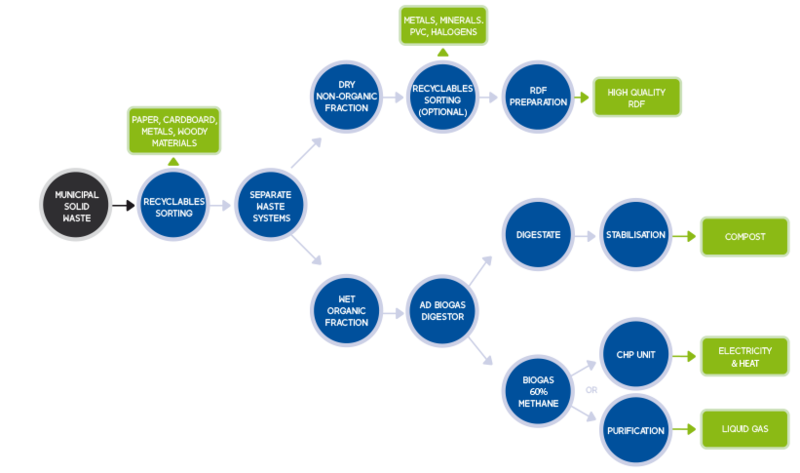 Sorting processes before and after the separation of the organic and non-organic fraction allow optimal recycling of paper and cardboard, plastics, glass and metals. The dry fraction from the SEPARATE Waste System can be easily prepared into high-quality RFD due to its minimal content of organics. It is suitable for use in RDF plants and high-temperature industries. SEPARATE stands for “Enabling market uptake of innovative separation and cleaning solutions for material recycling of all product groups contained in bio-wastes and MSW”. 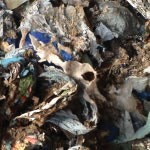 SEPARATE project carries out on-the-spot tests of different waste streams and analyses the quality and characteristics of the waste streams that have been separated with the new technology. The results of the analysis are certified by renowned institutes and laboratories in the test countries. This aim at demonstrating the exact composition of the waste streams and removing non-technical barriers to market replication of an innovative waste separation and cleaning process. The SEPARATE project is co-funded by the Eco-innovation initiative of the European Union.